Water spurting from two tubes at the Tianbu Reservoir yesterday, as China starts supplying fresh water via an undersea pipeline to Taiwan's Kinmen. The water comes from Longhu Lake, the second largest lake in Fujian. 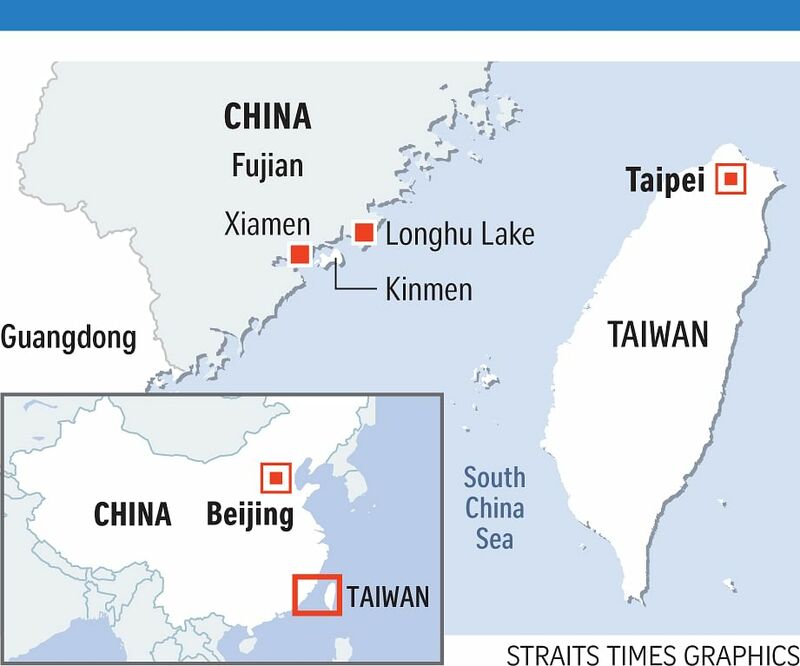 TAIPEI/ FUZHOU â¢ An undersea pipeline yesterday started delivering fresh water from the coastal Chinese province of Fujian to Taiwan's outlying county of Kinmen. The 28km pipeline running from the township of Jinjing in Fujian to Kinmen's Tianbu Reservoir will provide about 30 per cent of Kinmen's total water supply, according to reports. The water comes from Longhu Lake, the second largest lake in Fujian, reported Xinhua news agency. Under a 30-year water purchase agreement inked in 2015, Fujian will supply up to an average of 34,000 cubic m of water a day to Kinmen at a cost of NT$9.86 (S$0.44) per cubic m .
The daily capacity can be expanded to 55,000 cubic m in future, according to Xinhua. Investment for the water project totalled 388 million yuan (S$77.6 million). The new project comes at a time of growing strains in cross-strait relations. Since President Tsai Ing-wen of the pro-independence Democratic Progressive Party (DPP) took office in 2016, Beijing has ramped up military and diplomatic pressure on the island. Both sides split at the end of a civil war in 1949. In what is seen as the latest move to suppress Taiwan's presence in the international community, Taichung city's right to host the first East Asian Youth Games next year was revoked following a meeting of the East Asian Olympic Committee in Beijing on July 24. Pe rcentage of total water supply the 28km pipeline, running from the township of Jinjing in Fujian to Kinmen's Tianbu Reservoir, will provide Taiwan's outlying county of Kinmen. President Tsai yesterday slammed China for becoming even more overbearing towards Taiwan, reported Taiwanese media. "We all see that China has become more overbearing recently," she said, citing Taichung's lost chance to host the East Asian Youth Games and Beijing's pressure on international airlines to change their designation of Taiwan. Beijing has sent letters to international airlines to demand that they update their websites to reflect Beijing's view that Taiwan is a part of China. President Tsai yesterday said Taiwan will not yield an inch, no matter how great the pressure. Ms Tsai, who is also the DPP chairman, made the remarks on the campaign trail in Tainan for her party's nominee for city mayor, Mr Huang Wei-che, an d its city councillor candidates, reported Central News Agency. The fortified Kinmen island group, located just kilometres off China's south-eastern coast, was heavily shelled by Chinese forces in the late 1950s. A national security official told Taipei Times that China is trying to split the Taiwanese population by using carrot-and-stick tactics. Meanwhile, a ceremony was held at Tianbu Reservoir in Kinmen yesterday to mark the start of the water project between Kinmen's water authority and its counterpart in Fujian. The deal seeks to end Kinmen's long-time worries over water shortages which were accentuated by the growing number of mainland visitors. Kinmen county chief Chen Fu-hai said on Saturday the water deal will be followed by an "electricity link" and "bridge link" between Kinmen and Fujian in the future, reported Taiwanese media. Mr Chen dubbed them the "three new links", a reference to the "three mini links" that opened postal, transportation and trade connections between Taiwan and China starting in 1991. Kinmen first expressed its desire to buy water from China in 1996 when it suffered from severe drought, according to Taiwanese media. Four years later, Taiwan's Water Resources Bureau (now renamed Water Resources Agency) under the Ministry of Economic Affairs completed a report on the potential impact of such a project. The authorities from the two sides of the Taiwan Strait started to gather information and exchange views on the proposal in 2002. The Executive Yuan - Taiwan's top administrative organ - approved the project to channel water from Fujian to Kinmen in 2014. Related news and commentaries on Asean JCU finds success in its 'Students First' approach to education Read the latest ST Specials and Supplements right here!